All appointments need to be scheduled online only. Lee VanZyl was born and raised in South Africa and now lives and works in New Jersey and the NYC Metro Area. After spending the majority of her adult life as a lawyer in South Africa her journey through life took a surprising turn and she came into her mediumship. She realized that her true passion in life was working with the Spirit World, teaching others how to tap into their abilities and to assist people to step into their power and achieve their true potential in life. She has trained and taught classes at the Woodlands Foundation in Australia and New Zealand and has studied at the prestigious Arthur Findlay College in the UK taking classes in mediumship development as well as teacher training. Lee now teaches and works internationally and has also completed a teacher training course at the Arthur Findlay College, UK. 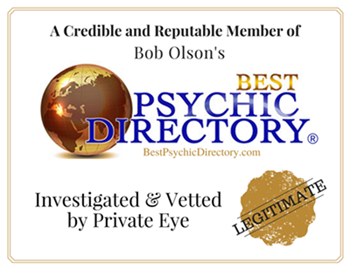 More recently, she has been tested and certified as a psychic medium, by Lisa Williams at Lily Dale, NY. Lee is a member of the International Spiritualist Federation. During the course of her spiritual journey, she has become qualified in the following modalities: psychic, mediumship, pranic healing, reiki, hypnosis, spirit rescue, past life regression, trance healing, life coaching and traditional African Shamanic Healings. She looks forward to sharing her gifts of mediumship and healing with you and to assist you through your journey in life. It is with extreme pleasure to write testimonial for a fellow Medium. Tonight, I had an extremely accurate phone reading with Lee VanZyl. During the reading, I was astonished at the information that was being relayed, as the messages were very detailed and given with the comfort of their love. Lee brought through a variety of friends and family members with true evidence of their lives. As a medium, I know they have never left us; but as a granddaughter, daughter and friend it is a welcomed heartwarming experience! Empowering and authentic! Lee is an amazing soul! I have been seeing Lee for several years and everytime I meet with her I only gain a better understanding and awareness of self. She empowers you to trust your own instincts and assures you the ability to feel confidence in self. She is always giving of her time, knowledge and experience. She has helped me immensely and I am very appreciative to Lee for helping me rediscover myself. Thank you Lee for your encouragement and faith in me. I never watched any Medium's or even believe in excepting that they can connect with any spirits. I needed closure for my mother's passing 6 months later and decided 'Hey why not try it'. Lee was amazing. It's not what I expected. It's very hard to make me believe in anything. I am so glad I met her and she was able to pass on what I needed to hear. I would recommend her. I had a friend waiting in the next room and couldn't believe that I was in tears and at peace. Lee stands out with her honesty, her ability to channel and her ability to heal. She will teach you to heal yourself rather than depend on her constantly. I have asked her to scan me from time to time just to make sure I do not have an attachment. She would scan me and if I was clear she would not charge me anything. Very effective healer. Has removed my bad luck due to a very bad spell and attachment. I went to see Lee with one other family member in the hopes of contacting a special someone we both recently lost. Lee was welcoming and friendly. She was able to connect with that person fairly quickly and channeled his messages beautifully. I would describe Lee's style as honest. She is not there to put on a show, yet we were very impressed. I would recommend Lee to anyone searching for a nonsense-free connection to loved ones as well as comfort and healing.